Well friends, I am officially done with my last fall semester of college. 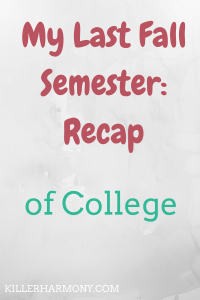 A lot happened this fall, and I am going to be recapping it with you and sharing what I learned this semester. I had a lot of different things going on; I made some important decisions. This fall semester was pretty busy, but I enjoyed it. I also plan to cherish every moment of the spring semester, because it will be my last. This semester was tough. I had more intense private flute lessons, since I did my first recital this semester. I also had four ensembles for the first time. I was in marching band, wind ensemble, orchestra and flute choir. I also took a couple of Spanish classes to go toward my minor. I took Spanish 4 as well as an independent study on learning languages. My hardest class by far was my basic conducting class. In a nutshell, that class is basically the culmination of everything you have done in music. You use theory, ear training, sight singing, history and even your own instrument. That class was difficult, but I survived. I’m so happy that it’s over. This semester was also my first semester working on campus; I became an opinion writer for my school’s paper. I loved the job, and I will be continuing in the spring. I also got to do a lot with this blog and with my first online business. In case you didn’t know, I have been blogging every day in December as part of Blogmas. I will go to posting twice a week or so after Christmas, but posting every day has reaffirmed my love for blogging. I moved into the dorms a few days early so that I could participate in band camp for marching band. Our first game/performance was the second week of classes this year, and so we need to get a lot done during camp. It was a busy week of marching and learning the music, but it was fun. We only had two new people in our section, and we all got really close. September was a pretty dull month. Nothing really happened outside of the norm, except that I had my last first football game. I got to hang out quite a bit with friends I made from my floor last year. In fact, half of my floor were returning members of the floor. Most of what I did was prepare for my upcoming recital. Oh, October. This was the month of my first solo recital. I went with a Sunday evening time so that my family could come and also friends and classmates. It was a little nerve-wracking, but after my first piece, I felt right at home. It was also around this time that I made the decision to take some time off from school after I graduate in May. I might pursue another degree in the future, but I just need a break. I really want to start my career, and I can’t do that when I have classes to worry about. This was another normal month. The only weird thing that happened was that the faculty quintet went on tour for a week and a half, so I didn’t have lessons during that time. There were some concerts and events. I celebrated a few people’s birthdays. And then of course, I got to have amazing food over Thanksgiving break. December in college basically means finals. You only have a couple weeks after Thanksgiving left and then you have all of your exams. I lucked out this semester and only had one final. My basic conducting final was a tad rough. I spent the past few days studying and reviewing, and I feel pretty confident about it all. Now that I am on break, I plan to use the extra time in my day to work on my blog and business. I have plans to start writing twice a week (after Blogmas ends), and I also want to add new listings to my Etsy shop. I currently have listings for printables, but I hope to add more printables as well as digital wallpaper. I also will work on my music for my senior recital for the spring. I am going to take it easy, because I am on break, but I want to be prepared. That’s it. That is how my fall semester went. It’s crazy just how fast it went by. I made new friends, got closer with some of my friends from last year and had a great start to my last year of college. I am looking forward to what the next few months have in store for me! How did your semester go? Let me know in the comments. Also, be sure to read my previous post and follow me on Twitter (@HannahHaefele) so you don’t miss future updates!